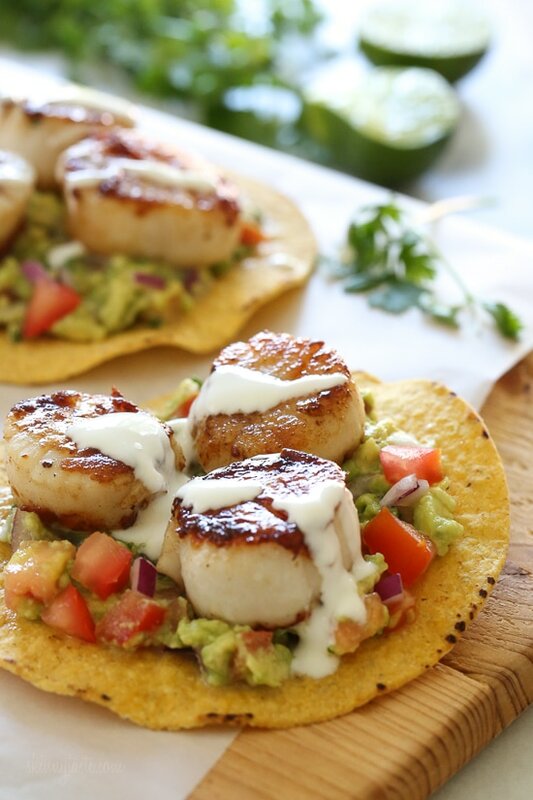 I love seared sea scallops, and served over guacamole drizzle with crema they are phenomenal and really easy to make. If you want to keep this low-carb, ditch the tostada shell and serve them over a salad instead! Mash the avocado in a small bowl with the tomato, red onion, cilantro, lime juice, salt, pepper to taste. Season scallops with salt and black pepper. Add the butter and oil to a 12-inch skillet on high heat. Once the butter begins to smoke, gently add the scallops, making sure they are not touching each other. Sear the scallops for 1 1/2 minutes on each side. The scallops should have a 1/4-inch golden crust on each side while still being translucent in the center. Spoon the guacamole onto the tostada, top with scallops and drizzle with sour cream. This may be a silly question but – this recipe only makes 2 Tostada, and lists it as 2 servings. does that mean that it’s only 1 Tostada each? I’m worried one may not be enough. Am I missing something? I’m tempted to quadruple the recipe for 4 people… will that be ok? Loved this recipe! Like others have said, this tastes like restaurant quality. My husband even joked that I could enter a cooking competition with a recipe like this! I was nervous having never cooked scallops before (and being a little timid since I have heard they can be ruined by any number of minor mistakes) but Gina’s directions are simple and easy to follow. So delicious – thanks Gina!! Do the scallops taste good leftover cold or should they be reheated in a microwave? Planning to take this to work for lunch. What about air frying the scallops? Absolutely delicious and simple to make! Just ate this for dinner – fantastic! 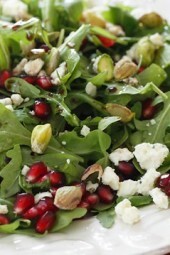 Flavors were so fresh and bright – LOVED THIS! Hi! Can you use frozen scallops? Thank you! I did. I defrosted them in the fridge overnight, drained them & patted them dry. Worked great. We just finished these and they were AMAZING!!! Our house is loving your recipes!! Thank you! My friend told me about you, and absolutely everything I’ve made is so delicious! Thank you so much! Made these last night for dinner and they were amazing !! I may even make them AGAIN tonight. 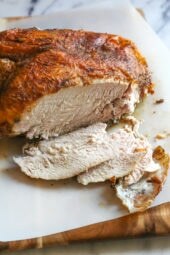 Great recipe and easy to make as well. This recipe was ridiculous! Seriously restaurant quality. Never had anything like and it was so good. My husband loved it as well. Will definitely make this again. 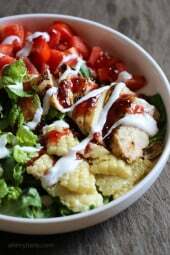 Another home run recipe from skinny taste. Hi – just wondering where would I buy “tostados?” Thanks! I am allergic to avocados, is there anything similar that I could use for a substitute? PS I have both of your cookbooks and love them! This is soooooo good and really easy to make. I had this on the table in less than 20 minutes. It was so light but filling and was perfect with a side salad. I can envision myself eating this a lot during the summer that’s coming up! I love scallops and this recipe looks delicious! Are all these delicious recipes still in the range of 1500 calories? It’s almost to good to be true! Thank you. This was delicious! I added a squirt of Siracha sauce to the thinned sour cream added great color and a little zip. Perfect weeknight meal. I just bought two of your cookbooks . But can’t find WW smart points anywhere in them … how can I get these for the recipes I. The books? Admittedly a super dumb question, but did you pick these up and eat them or cut with knife and fork? These look absolutely amazing, and I love that it’s something quick to put together. I also am in love with avocado and crema so this is definitely going on the meal plan this week! P.S. I use both of your cookbooks for meal planning every week. I just made these for dinner tonight and they were amazing! I love how the scallop was prepared so simply, but tasted so delicious. This recipe will definitely be in my monthly rotation. Scallops are SO simple and delicious, not much work needed. Thanks for noticing, it’s correct now! looks amazing! Perfect for Lent. Thank you! These look absolutely amazing! On the menu!